Imagine the elevator/escape from SHIELD sequence in Captain America: The Winter Soldier. Now imagine it as if it was a) a comic book, b) featured no trace of Captain America at all, c) had Black Widow instead, and d) was somehow even better. Spoilers ahead for Black Widow #1, by Mark Waid, Chris Samnee, Matthew Wilson, and Joe Caramagna. Rewatching those moments from Winter Soldier, it’s hard not to see this opening issue as Waid, Samnee, Wilson, and Caramagna’s ultimate homage to the movie. The whole thing is a nearly dialogue-free action sequence (Natasha doesn’t speak until the final page) that we pick up in medias res; Natasha has stolen something from SHIELD, and Maria Hill has disavowed her as a fugitive of SHIELD for it. But they don’t match Black Widow laying the smackdown, barreling her way through a wall immediately into another scrap. Except it’s not a building. It’s a SHIELD Helicarrier. Natasha may not have a the shield, but bombs work well enough to take it down. There’s obviously a lot of questions left at the end of Black Widow #1, which might as well be the longest, best-drawn teaser trailer for a comic book series I’ve seen in a long time. 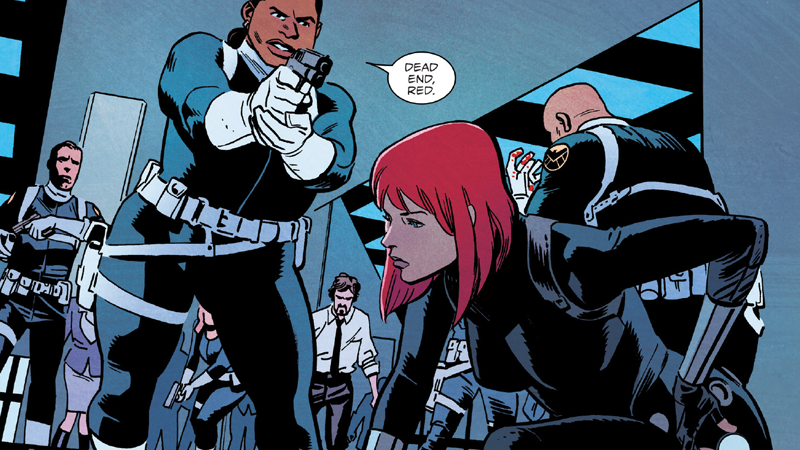 Just like that amazing sequence from Winter Soldier, Black Widow #1 never lets up on the action, and it’s a stunning visual treat. The visual storytelling, as well as Samnee and Wilson’s gorgeous art, made this an absolute blast to read, even if it doesn’t answer anything or offer much in terms of set -up. If we can get a spy thriller series with action like this from Black Widow every month—and it should be unsurprising if we get it, considering this is the same creative team that nailed an incredible run on Daredevil—this is going to be one hell of a ride. Pay attention, Marvel studios! If there’s ever a Black Widow solo movie, this might just be the series to turn to for inspiration. Gifs by Katharine Trendacosta. Contact the author at james.whitbrook@io9.com.